Have you heard of blue zones? There are certain areas of the world with large pockets of people live measurable longer lives. Dan Buettner, the author of The Blue Zones traveled to 5 of these regions of the world with the hopes of discovering the secret to living a long life. I, personally, was expecting this book to be a lecture on what and what not to eat. 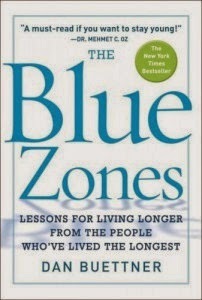 And The Blue Zones does contain some of that information. As you would expect, eating lots of produce, less meat, more food straight from the source is typical of most of these zones. This was no revelation to me, as we the American people are currently bombarded with instructions to eat clean, whole foods. Nothing earth-shattering in this category. As far as exercise, very few of the centenarians interviewed in this book spent their free time sweating it out at the gym. Their activity came in the form of work, walking, and an active lifestyle. The true lesson in this book, however, was not only living long, but living well. The more surprising results of Buettner’s study strayed from the physical into the social and emotional. First, he discovered that one thing the centenarians had in common was a purpose for living and a reason to wake up every morning. For some it was family, others had gardens, helping others, housework, a job, or even a social life to keep them going. hardship, and to whom they could vent and gossip. They could share the various stages of life, such as married life, life with children, and old age, and always know they had someone who understood, who was going through the same thing. Honestly, I see that support component lacking in our country where technology has made it easier to move out and away from our family nucleus. We make close friends in college and then move to every corner or the country or globe. (And we all know how difficult it is to make new friends as an adult). So what happens when a child gets sick, we need someone to watch the kids, or let the dog out while we’re on vacation? What happens when we need someone to vent to when our jobs get to be too much or when being a stay at home parent gets too lonely? Stress builds up when we try to do everything ourselves, and we have no community on whom we can rely. This was an interesting read for me which resulted in some lifestyle evaluations. I began thinking about how the foods and activities I choose are affecting my body long term. I started thinking about how I could both use the social support in my life, and be that social support for others. Obviously no one can guarantee living to 100. Accidents, disease, and unexpected events occur every day, no matter how healthy a person is. At the end of the day, our times are in God’s hands. But it is also important to be good stewards of the gifts He has given us. Do you think of your long term mental and physical health, or are you living for today?